The President of India, Shri Pranab Mukherjee has conveyed his greetings and felicitations to Her Majesty the Queen Elizabeth II of the United Kingdom on her birthday which is on April 21. In his message, the President has said, “I have the pleasure to convey, on behalf of the Government and the people of India, warm greetings and felicitations to Your Majesty on the occasion of Queen’s Day. It is a matter of great satisfaction that the ‘Enhanced Partnership’ between India and the United Kingdom has been deepened and strengthened in recent years through our regular dialogue and fruitful cooperation in areas of shared interest. Your Majesty’s valuable contribution to the building of trust and mutual understanding between our two great nations is very much appreciated. 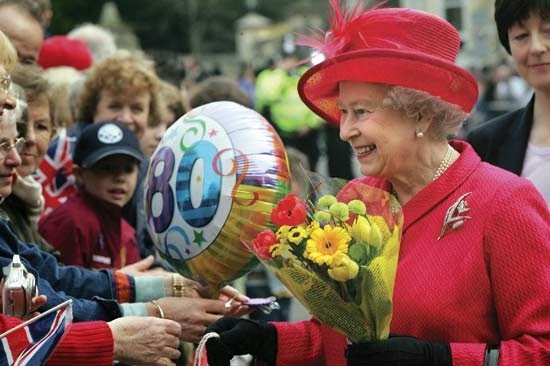 Please accept my sincere wishes for Your Majesty’s good health and personal well-being. I take this opportunity to convey the best wishes of the Government and people of India for the continued progress and prosperity of the people of the United Kingdom”. Probationers of Indian Defence Accounts Service, Indian Civil Accounts Service, Indian Railway Accounts Service and Indian P&T Finance & Accounts Service called on the President of India, Shri Pranab Mukherjee today (April 20, 2015) at Rashtrapati Bhavan. Addressing the probationers, the President said that good ‘Public Financial Management System’ (PFMS) is the key to good governance. The organized accounting services that they represent are charged with the responsibility of building and maintaining a strong and robust system of financial management. In almost all countries of the world today, there is a move towards developing ‘Integrated Financial Management Information Systems’ (IFMIS) and towards setting up Standards in Accounting, Auditing and Budgeting. The Government of India is also moving towards such a system. In India today this is a necessity in view of the increasing quantum of public expenditures which require a sound system of tracking, monitoring and reporting to be in place. In developing such a system we need to learn from best global practices and build upon them. The President said that there are rising expectations amongst the public for greater efficiencies in service delivery accompanied by transparency and accountability in government processes. In order to address these concerns, it is imperative for Government Departments to modernize systems by making best use of Information & Communication Technology and to make such systems citizen-centric, secure, efficient, economical and transparent. The Tax Information Network, OLTAS, the National Pension System are all extremely fine examples of pan-India systems which have simplified life for the ordinary citizen and have introduced greater efficiency and transparency in key areas of Government’s functioning. He emphasized that this trend shall only intensify in the future and he urged all officers to take part, as and when they have the opportunity to do so, in the development of such pan-India systems. The President said that he had been informed that NIFM, apart from a multitude of on-campus activities, also organizes attachments for probationers with various offices and organizations of relevance where they are exposed to practical aspects of governance. He expressed happiness that probationers are also taken to the USA for an exposure to financial management practices at the federal and the provincial government levels. He urged the probationers to assimilate the learnings that they gather from such important country exposures and apply them appropriately in the Indian context. The President said that keeping pace with the fast-changing world of information and communication technology also requires constant up-gradation of systems and processes. We need to examine how best we may use technology to make our payment and accounting systems seamless, as also progressively use IT tools in auditing to not only unearth frauds but also to evaluate and monitor the processes and outcomes of various government schemes. The challenges are many and the opportunities are vast and immense. He said he was sure that all of them will rise to the occasion and live up to the expectations of their countrymen. The President said that the Government of India decided to establish the ‘National Institute of Financial Management’ (NIFM) in 1993 to train the newly recruited officers of the Finance and Accounts Services. The idea behind setting up NIFM was not only to train probationers in subjects related to Financial Management but also to inculcate a sense of camaraderie and esprit d’ corps amongst service officers. The opportunity of staying and learning together with officers from the different accounting services shall prove to be extremely beneficial to them in the years to come, he said. The President said that as Union Finance Minister, he was the President of the NIFM Society between 2009 and 2012 which gave him the opportunity of getting to know about the activities of NIFM. He said that he was happy to say that NIFM had progressed well in the two decades of its existence. Various long term courses and Management Development Programs on cutting edge financial issues are now being organized by NIFM in addition to training programs in public financial management for Defence Services, State Governments, Banks, Public Sector Enterprises, Autonomous bodies and other stakeholders of Government. Another important area that they have branched out into is organizing long term and short term courses on financial and securities markets in collaboration with the BSE and NSE. It was a matter of satisfaction that NIFM had entered into MoUs with various Universities and institutions in the USA, Europe and Asia, apart from tie-ups with various institutions in India. He stated that these collaborations need to be encouraged as they impart a much needed global perspective to the learning that is imparted and also allow for cross cultural sharing of ideas and experiences.